Last weekend boutique Brooklyn cheese shop Stinky Bklyn held its first annual cheese-eating contest as part of their neighborhood's Smith St. fair. The winner was Oliver Butler, who scarfed down 6 oz. of Cantal in one minute. In addition to the respect, admiration, and perhaps disbelief of his peers, the prize for winning the contest (as shown in the photo above) is a boxing-style belt inscribed with Butler's name. According to this article from the Brooklyn Daily Eagle, "Butler is a long-time cheese eater, and is known in some circles as the “cheese baron.” His friends all thought he would win, and his girlfriend said this victory was a dream come true. He ate a pound of cheese that morning as preparation, along with the Hungry Man’s Breakfast, from Joe’s on Court Street." Sounds like this guy is our target audience! Hey Oliver, if you read this blog, give us a shout out! 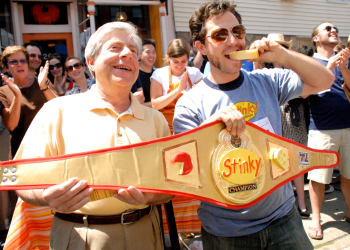 Also in attendance was Brooklyn Borough President Marty Markowitz, who with his many public appearances at such events has helped make Brooklyn the world capital of competitive eating." In addition to the cheese eating contest, Brooklyn has hosted the annual Nathan's Hot Dog Eating Contest, a Cheesecake Eating Contest, and even a Pizza Eating Contest. Hey I have an idea for an eating contest: let's try and see how much food we could donate to people in his country who are too poor to afford to eat well! Now there's an eating contest I can get behind.